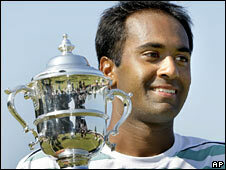 Lucky loser Rajeev Ram made the most of his second chance to win the ATP Hall of Fame Championship in Rhode Island. The American, who only reached the main draw after Mardy Fish was called into the US Davis Cup team, beat compatriot and third seed Sam Querrey. Ram lost the first set on a tie-break but hit back to claim the next two for a 6-7 (3-7) 7-5 6-3 win. Sunday's win at the US$500,000 grass-court event gave the 25-year-old Ram his first ATP crown. "This is the biggest moment of my career and I will enjoy it and keep working hard," said Ram, the world number 181. "These days don't come around too often and when you get to this stage you hope to take advantage of the opportunity. Even though Sam was the favourite there's pressure on both players because it's the final. "I relaxed and loosened up on my serve in the third set and picked up my game. I just concentrated on my game and tried to keep pressure on him. My style is to rush in with my serve and volley game." Querrey said: "I wasn't serving as well as I did in my last four matches and he played well, credit to him. I was lucky to win the first set and he played the big points well. "He started putting pressure on me in the third set and he did a good job. I thought I was playing alright but he served well in the third set."